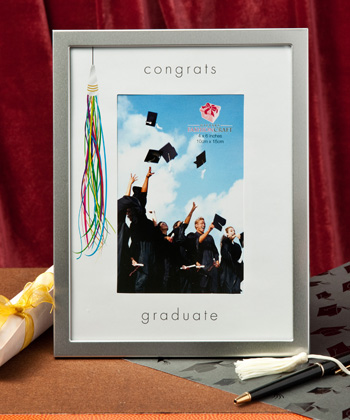 Our graduation photo frames are a thoughtful gift for your special celebration. Insert your photo in the 4 x 6 picture frame and these will be much appreciated by family and friends. 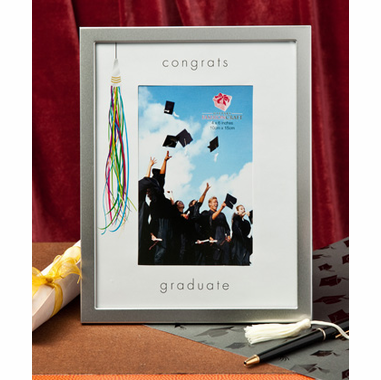 Each has a multi color tassel graphic with a brushed metal finish border and a nice white mat. Each measures 9 1/8"H x 7"W and a "congrats graduate" message and is for vertical display of a 4" x 6" photo and a black velvet easel back. Each frame comes individually packaged in an acetate box.